“Elegant” and “Microsoft” are usually not words that go together. 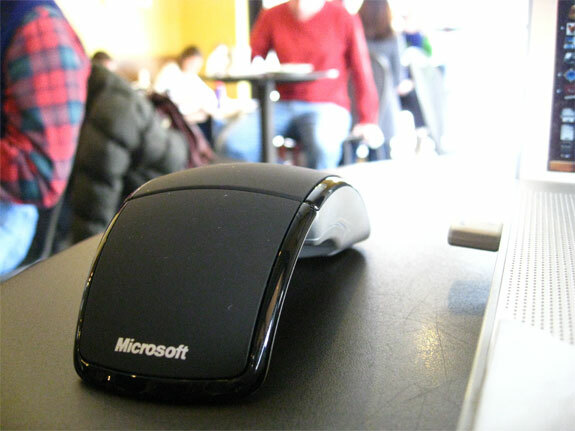 Yet somehow those adjectives managed to meet up in the cool, wireless Microsoft Arc Mouse. 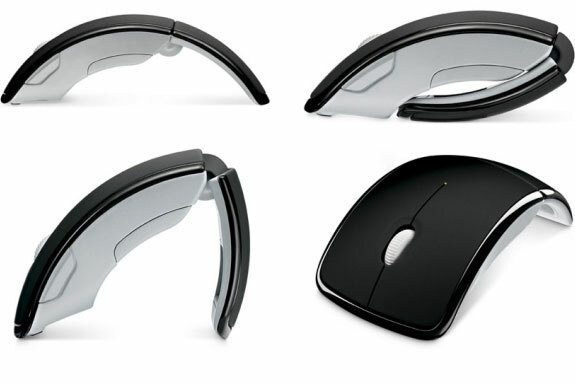 The Arc Mouse (or “Arch Mouse” as many people spell it) strikes a sleek wing-shaped silhouette when it sits open on a desk. It looks cool and, well, beautiful. The Arc Mouse is beautiful to use too. 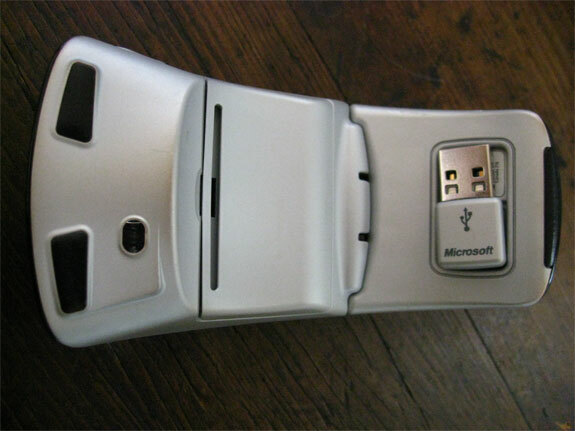 Unfold the mouse, plug the thumbnail-sized wireless receiver into your computer’s USB port, and you are ready to go. The mouse does not require a direct line of sight to it’s USB receiver to be effective. 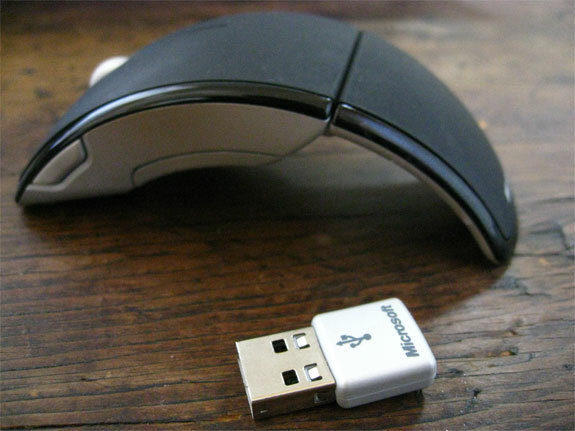 Microsoft claims that the Arc Mouse works up to 30 feet (9 meters) from your computer. While we didn’t unfurl our tape measure to verify that we we can attest that the Arc Mouse operates as well from across a large room as it does when used next to your computer. 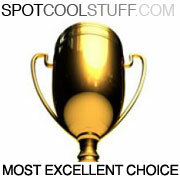 (Whether your eyes can read the text on your screen from across a large room is a different matter). 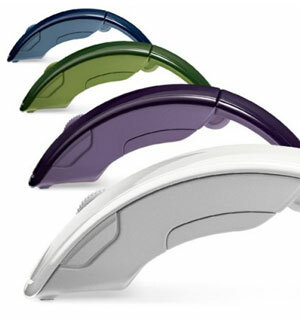 The Arc Mouse also works well on nearly any solid surface that’s marginally smooth. 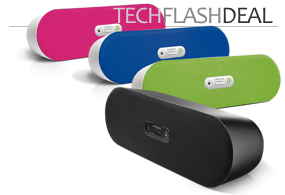 We’ve effectively used ours on a wooden desk (without a mouse pad), on a rough table cloth, on a shinny table in a coffee shop, on a bed sheet and on a pillow and even on our pant leg during a flight. 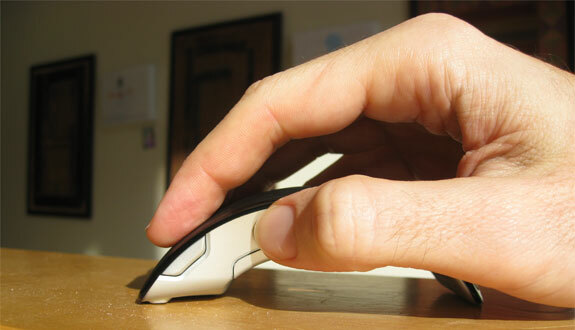 The Arc Mouse folds nearly in half (see photo, above) to fit into its included carry case. Folding the Arc Mouse also turns it off. We leave ours in the unfolded “on” position almost continuously, Spot Cool Stuff being hopelessly lazy about such things. And with even with that the two AAA batteries in our Arc Mouse lasted nearly three months! One cool little design feature: The USB receiver magnetically attaches to a groove underneath the mouse. And, yes, the Microsoft Arc Mouse works on a Mac. 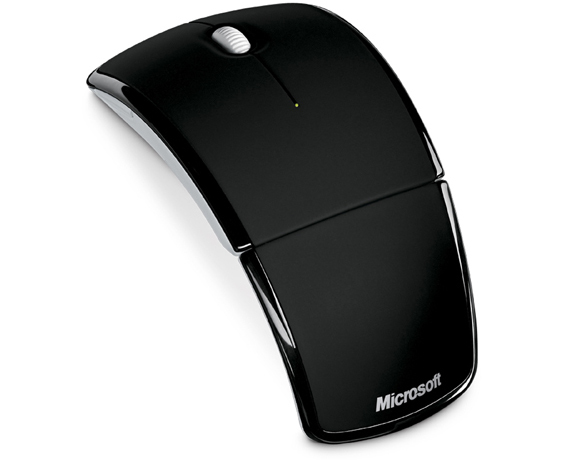 For all those reasons we give the Microsoft Arc Mouse our Most Excellent award. The Arc is, in fact, our favorite mouse, a good choice for use with a desktop and a superlative one for mobile laptop users. 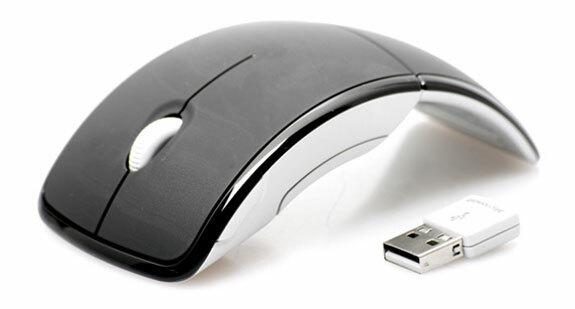 August ’09 update: Though we like the classic black, the Arc Mouse is now available in a variety of colors. Looking at the photos I can see how you’d think so. But, no, fragility is very much NOT an issue. 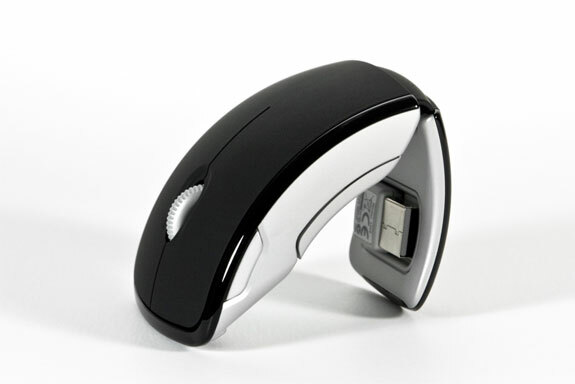 The back end of the arc mouse snaps solidly into place when it is folded open or closed. We actually lost the carry case to our arc mouse ages ago. When we travel with this mouse we fold it up and throw it into our bag with our other assorted belongings. Our arc mouse has stood up to months of this abuse and is still in fine working order. How sturdy is this thing? The bending part looks fragile.